Floating Bluetooth speakers are an exciting alternative to the casual Bluetooth speakers. They are elegant, extremely portable, and take very little space in your room. Additionally, they provide remarkable sound quality as compared to the usual and normal Bluetooth speakers. Levitating speakers aren’t entirely a new trend in the world of music. Currently, the market abounds with these levitating speakers, therefore, it can be a bit hard choosing one if you are not familiar with these units. Therefore, here are some of the best floating Bluetooth speakers to help you in your search. They have been chosen based on their design and popularity on the market. The Fineway floating speaker comes in a black color accented with red markings. The speaker system consists of a magnetic base and a floating orb which spins as it operates. The globe design features a special sound guide cone to improve its 3D surround sound effect. In addition to that, it can easily integrate with smartphones and PCs, thanks to its in-built NFC and Bluetooth functions. Allows you to play as the battery charges. Wireless range goes up to 10 meters. The base has to stay plugged in for the speaker to float. It’s tricky to balance the orb. It is sold by reliable sellers on Amazon and is available for free shipping. 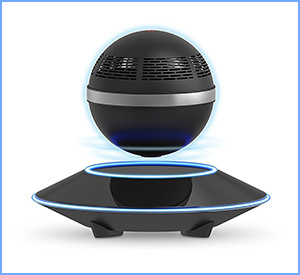 The MOXO X-1 is an innovative levitating speaker that offers fascinating 360-degree surround sound. It comes with a built-in NFC function and Bluetooth connectivity for automatic pairing with devices. 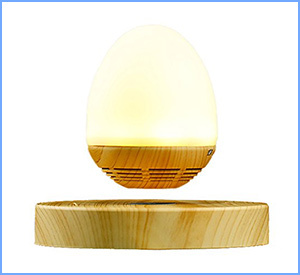 When in use, the orb spins 10 mm over the magnetic base as it emits beautiful blue light. The orb can be charged while it’s afloat. Doesn’t deliver sufficient punch for bass lovers. It rather basic – lacks an extra appeal. The ICE harmony comes in a royal gold color. 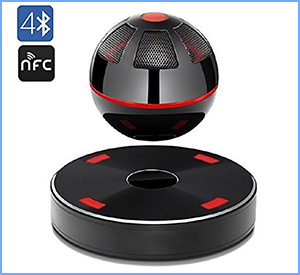 The egg-shaped orb spins 10 mm over the magnetic base of the speaker. The design of the speaker allows for 3D sound emission. When in use, the delicately designed soft cushion speaker emits an elegant light ambiance. You also have the liberty to regulate the light intensity. This makes it an excellent bedside companion. The lit squishy orb doesn’t heat up over time. Its light intensity can also be dimmed or switched off altogether. Has an appealing glow and beautiful appearance. The base can be used separately as a Bluetooth speaker. Has to be plugged in to activate the magnetic field of the base. It’s difficult to tell whether the orb battery is fully charged or not. 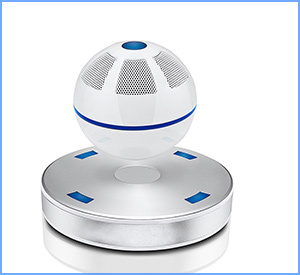 The Ice Harmony is frequently bought together with ICE Orb levitating speaker. 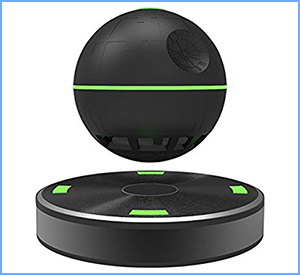 The Hellosy floating speaker is one of the best floating Bluetooth speakers, particularly for the Star Wars fans. It features a sleek design with inbuilt lights that you can easily can be turn on and off. The orb produces a galactic glow that adds a festive visual aspect to your music experience. The speaker delivers 3D sound effect which is facilitated by its cone-shaped design. Offers unique glow and great looks. Too pricey for its sound quality. Also, its build material is not the best for its price. It is a high selling speaker from Hellosy, so its availability is limited. The Arc Star is a simple yet functional floating speaker from the reputable ICE Company. 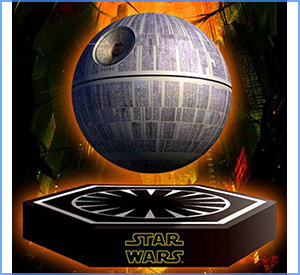 It comes in a fantastic galactic theme and produces remarkable sound quality. It supports both NFC and Bluetooth connectivity, which offers seamless connectivity across Android/Apple devices and PCs. The Arc Star is also multifunctional – both a speaker and a smartphone charging hub. Easy to levitate. To set it up, cup the globe on your hands and lower it towards the base until it lights up. Sound quality is low as compared to its cost. May require an equalizer app for the best experience. The 7 Arc star is in stock. It’s sold by TSH Global and shipped for free by Amazon. 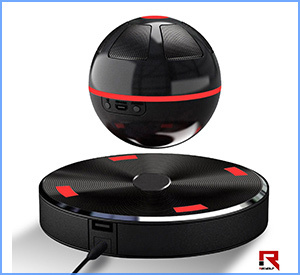 The Ice Orb is one of the best floating Bluetooth speakers based on its build quality. Its magnetic base comes in a chrome finish which is accented with blue LED lights. The orb and the base have separate ergonomic charging ports. You can also use the speaker itself separately as a simple Bluetooth speaker, thanks to its inbuilt battery and controls. Connects seamlessly with any device with NFC or Bluetooth function. The LED lights inside the speaker give it quite a beautiful glow. Very few are made hence the stock is limited. It is readily available on Amazon, and shipping is free. 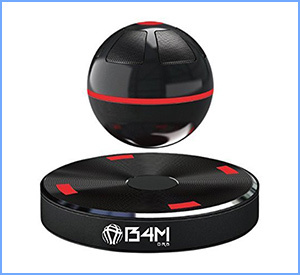 The B4M ORB is a mysterious dark black portable speaker that delivers loud 3D surround sound. The 4.1 Bluetooth and NFC functions allow seamless connectivity over a 10-meter range. The speaker comes with a 1500 mAh rechargeable battery that can last up to eight hours. Easy to levitate – the instructions are easy to follow. The dark-black look with red accents makes it very pleasing to watch. It is fairly loud as compared to other Bluetooth speakers. Too pricey for its features. 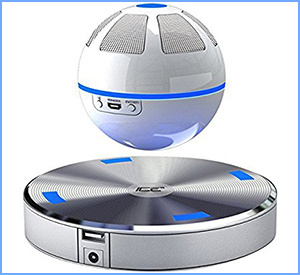 The ZVOLTZ levitating speaker is one of the best floating Bluetooth speakers offering premium audio features. The 5W Hi-Fi speaker rotates over its aesthetic saucer-shaped magnetic base as it operates. The ZVOLTZ allows you to make and receive calls, thanks to its built-in microphone. It is the perfect floating speaker for bass lovers. Delivers a more potent bass punch and 360 surround projection. Supports hands-free calling and receiving calls. Unique base design with LED effects. Small and portable – fits in the palm of your hand. Just like the others, the base has to be plugged in for it to levitate. Takes practice to balance the globe on the base. This product is available on Amazon, and it qualifies for free shipping. The MOXO Levitating Portable speaker is one of the best floating Bluetooth speakers because of it simplistic and elegant design. 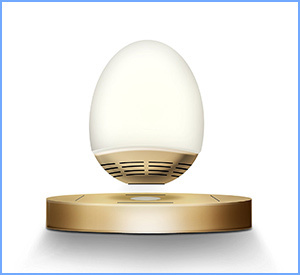 It comes in a UFO egg shape surrounded by a bright ambient light. It has a guided 360-degrees sound setting meant to deliver impressive surround sound effect. Unlike most other floating speakers, it supports wireless charging. Wireless charging allows you to listen to music for longer. Poor instructions for use, however, it works great. Balancing the egg-shaped speaker may require practice for some. The ReVolt Levio Bluetooth speaker tops the list of the best floating Bluetooth speakers. It comes in aesthetic black and red design. The inbuilt battery is rechargeable and can last up to 8 hours. Also, the magnetic base has a USB port which you can use to charge your mobile device. Its levitation process is easy due to the Powerhouse Balancing System. It’s affordable, yet it brings with it premium features. Can be used as a phone charger adapter. Some products may be faulty at delivery. The ball can only charge when connected to the base. ReVolt Levio is readily available on Amazon, and it qualifies for free shipping. These are some of the best floating Bluetooth speakers on the market today. Great floating speakers offer quality surround sound and quick connectivity with different media sources. You might also like to compare the products in our list of best Bluetooth speakers. If you have any thoughts or comments about this list, share them in the comments section.